Juilliard Quartet, Cleveland Quartet, Paganini String Quartet, New Music String Quartet, Lenox String Quartet and Curtis Quartet. Andy Anderson, Bruce Bransby, Kristen Bruya, Jon Deak, Michael Cameron, Diana Gannett, Peter Guild, Eric Hansen, Erik Harris, Frano Kakarigi, Gary Karr, Robert Kassinger, Benjamin Levy, Edgar Meyer, Andrew Moon, David Murray, John Schiavo, Anthony Stoops, Dennis Trembly, Derek Weller. Premiere of Three Dialogues for double bass and piano by Alan Daniels on January 7, 1958 at the Rothschild Foundation in New York. Piano Quintet in a: Op. 114 (“The Trout”). Camden, NJ: RCA Victor, 1957. LP Recording. Franchetti, Arnold. Three Italian Masques. New York, N.Y: New World/CRI, 1996, 2009. Sound recording. Brant, H: Rainforest (the Henry Brant Collection, Vol. 6) (brant). Hong Kong: Naxos Digital Services Ltd, 2007. CD. Menotti, Gian Carlo. The Unicorn, The Gorgon, and The Manticore. Hayes, Middlesex, England: Columbia, 1957 ?, LP Recording. Library of Congress Music Division concert, 1964-03-27. 1964. Reel-to-reel Recording. Leopold Stokowski, Serge Koussevitsky, Sir Thomas Beecham, Leonard Bernstein, Herbert Von Karajan, Zubin Mehta, Sir George Solti, Ernest Ansermet, Pablo Casals, Aaron Copland, Otto Klemperer, André Previn, Michael Steinberg and Igor Stravinsky, with whom he recorded several works. May 1, 2000, Ann Arbor, MI, USA. “Memories of Stuart Sankey.” The Bass Line : Publication of the International Society of Bassists. May 2000, pp. 1-5. Borém, Fausto, and Stuart Sankey. “Sobre a Questão de Pequenas Alterações Na Realização Das Partes de Contrabaixo de Beethoven (Reprinted and Translated from ’International Society of Bassists Annual Journal’, vol. 1, no. 4, Spring 1975, pp. 95-9) (Includes Abstract in English and Portuguese).” Musica Hodie, vol. 6, no. 2, 2006, pp. 11-34. Sankey, Stuart. “The ‘Concerto’ of Koussevitsky.” Journal of the International Society of Bassists, vol. 18, no. 3, 1993, pp. 40-42. Sankey, Stuart, and David Walter. “As You like It–Original or Transcribed Bass Repertoire.” American String Teacher, vol. 37, no. 3, 1987, pp. 47-49. Sankey, Stuart. “Double Bass Playing in the Peoples Republic of China.” Journal of the International Society of Bassists, vol. 11, no. 2, 1985, pp. 4-5. Sankey, Stuart. “On the Anticipation of Crossings by the Left Hand.” Bass World, vol. 5, no. 2, 1979, pp. 474-477. Sankey, Stuart. “Anticipating Left-Hand String Crossings on the String Bass.” Instrumentalist, vol. 32, Oct. 1977, pp. 90-92. Sankey, Stuart. “On the Question of Minor Alterations in the Double Bass Parts of Beethoven.” Bass World, vol. 1, no. 4, 1975, pp. 95-99. Borém, Fausto. “A Brief History of Double Bass Transcription.” Bass World: The Journal of the International Society of Bassists, vol. 21, no. 2, Fall 1996, p. 8. Faculty Activities: Stuart Sankey: Dittersdorf, Symphony Concertante, for double bass viola and orchestra. American Chamber Orchestra, Robert Scholz cond., with herbert Feldman viola., Town Hall, March 15, 1955. The Juilliard Review, vol. II, no. 2, Spring, 1955, p. 62. New Works and Comissions: Sigurd Rascher has commisioned Stuart Sankey to write Theme and Variations for bass saxophone and concert band. The Juilliard Review, vol. II, no. 2, Spring 1955, p. 61. Stuart Sankey gave the first perfomance of Alan Daniels’ (1952) Three Dialogues for double bass and piano, on January 7 at the Rothschild Foundation in New York. he perfomes on the Schubert “Trout” Quintet, recorded by the Festival Quartet on RCA Victor disc LM-2147. The Juilliard Review Alumni supplement, Winter 1957-8 The Juilliard Review, vol. V, no. 2, Winter, 1957-58. pp. 15-18. Applebaum, Samuel, and Henry Roth. The Way They Play: Book 6. , 1978. Scoggan, James, Paul Ellison, Barry Green, Elizabeth Federsen, Stuart Sankey, and David Walter. What the Non-Bassist Should Know About Teaching the Double Bass: A Forum. n.p., 1977. Yorke Solos: Vol. 1 for Unaccompanied Double Bass. London: Yorke Edition, 1979. Prof. Sankey has invited Frano Kakarigi to offer a premiere of this concerto in 1987. 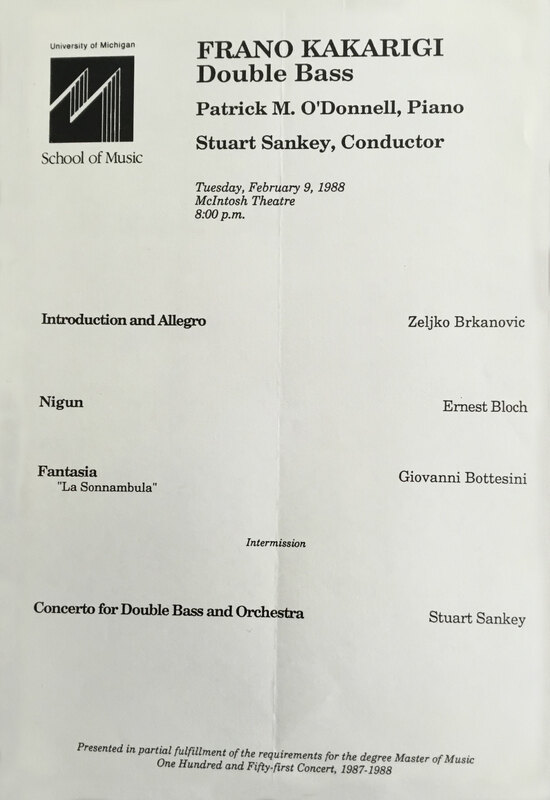 The premiere took place on February 9, 1988 at McIntosh Theatre of The University of Michigan, with Frano Kakarigi as a soloist, Stuart Sankey as conductor and the U. of Michigan, School of Music Orchestra. The following audio files of the concerto premiere are presented by courtesy of Frano Kakarigi. Although closely resembling the format of Bizet’s “Carmen” overture and other arias, this is not a mere transcription, yet an original work and thus classified here. Bizet, Georges. Carmen Fantasy on Themes from Bizet’s Carmen: For String Bass and Piano. Arranged by Stuart Sankey, New York: International Music Company, 1993. Lee, Hyungtag. A Stylistic Comparison into the Carmen Fantasy for Double Bass: Proto, Sankey, and DaXun. D.M.A. Thesis, University of Cincinnati, 2016, pp. 24-32. August 13, 1990 at Johansen Festival in Victoria, British Columbia, Canada. Horovitz, Joseph, Gary Karr, Patrick Thomas, Edvard Grieg, Wilfred Josephs, and Stuart Sankey. Double Bass Concertos. Sydney : ABC Classics, 438 612-2, 1995 (2013). CD. Gypsy Music: For Clarinet, Guitar and Bass : Score and Parts. New York: International Music Co, 1989. Sankey, Stuart, and Algernon C. Swinburne. Five Choral Songs. , 1979. Stuart Sankey. Five Choral Songs. Aspen Music Festival, 2007. CD. Recorded July 27, 1992 at the Tent, Aspen Music Festival, Aspen, Colorado. “Indiana University Wind Band.” Featured conductors: Ray Cramer, Eric E. Anderson ; Featured composers: Vittorio Giannini, Donald H. White, J E. Barat, Julius Fučík, Clifton Williams, Stuart Sankey, J.-B Arban, and Fred Jewell. [program, 1985-1986, No. 140]. , 1985. Fox, Frederick, Akira Endo, and Stuart Sankey. Night Ceremonies (1979). Louisville, Ky: Louisville Orchestra, 1984. LP. Mester, Jorge, and Stuart Sankey. Archive Recordings: Season of 1981. , 2005. Archive CD. Simandl, Franz. New Method for String Bass. Arranged and Edited by Stuart Sankey. New York: International Music Publications, 1980. Simandl, Franz. New Method for String Bass, Part 1. Arranged and Edited by Stuart Sankey, New York: International Music, 1968. Libon, Philippe. 12 Studies for String Bass. Edited by Stuart Sankey. New York: International Music Company, 1970. Published by: Moscow: Muzgiz, 1939. Plate 16287. Orchestral Excerpts from the Symphonic Repertoire for String Bass: Volume VIII. Compiled and Edited by Stuart Sankey, New York: International Music Co, 1987. Bottesini, Giovanni. Concerto for String Bass and Piano. Edited by Edouard Nanny and then edited by Stuart Sankey. New York: International Music Company, 1963. Bottesini, Giovanni. Concerto No. 1 in B Minor – One Movement: For String Bass and Piano. Edited by Stuart Sankey. New York, NY: Int. Music Comp, 1963. Bottesini, Giovanni. Fantasy on Themes from “la Sonnambula” by Vincenzo Bellini: For String Bass and Piano. Edited by Stuart Sankey New York: Internat. Music Co, 1991. Hoffmeister, Franz A. Concertino No. 2: For String Bass and Piano. Edited by Stuart Sankey. New York: International Music Company, 1977 (1991). Dittersdorf, Karl Ditters von. Sinfonia Concertante in D Major for Viola, String Bass, and Piano. Arranged by Stuart Sankey. New York City: International Music, 1985. Bottesini, Giovanni. Grand Duo Concertant: For Violin, String Bass, and Piano. Edited by Josef Gingold and Stuart Sankey. New York City: International Music, 1985. Bottesini, Giovanni. Passione Amorosa: For Two String Basses and Piano. Edited by Stuart Sankey. New York: International Music Company, 1986. Mozart, Wolfgang A. Per Questa Bella Mano =: By Your Lovely Hand : Aria for Bass Voice with String Bass or Cello Ad Libitum. Arranged by Stuart Sankey. New York: International Music, 1952 (1964). Album of 10 Classical Pieces: For String Bass and Piano. Arranged by Stuart Sankey, New York: International Music Company, 1969, (1980). Bach, Johann Sebastian. Sonata No. 2 in D Major, S. 1028 for String Bass and Piano: Originally for Viola Da Gamba. New York City: International Music Co, 1962. Beethoven, Ludwig. Romance Opus 50 for String Bass and Piano. Initially transcribed by Franz Simandl, edited by Stuart Sankey. New York: International Music, 1976 (1981). Bloch, Ernest. Prayer: (no. 1 from “Jewish Life”) : for String Bass and Piano. Arranged by Stuart Sankey. New York: Carl Fischer, 1997. Bloch, Ernest. Meditation Hebraique: For String Bass and Piano. Arranged by Stuart Sankey. New York: Carl Fischer, 1997. Boccherini, Luigi. Rondo in D Major for String Bass and Piano. Arranged by Stuart Sankey. New York, NY: Int. Music Company, 1971, 198- (1991). Boccherini, Luigi. Sonata No. 6 in a Major: For String Bass and Piano. Arranged by Stuart Sankey. New York, NY: Int. Music Comp, 1964 (1980). Bruch, Max. Kol Nidrei Opus 47 for String Bass and Piano. Arranged by Stuart Sankey and Herman Reinshagen. New York: International Music, 1981. Bréval, J. B. Sonata in a Major for String Bass and Piano. New York : International Music, 1995. Debussy, Claude. Sonata in a Major: For String Bass and Piano. Piano part edited by Robert Casadesus. Solo bass part arranged by Stuart Sankey. New York: International Music Company, 1991. Dragonetti, Domenico. Concerto in A Major, for String Bass and Piano. Most likely composed by Edouard Nanny, newly edited by Stuart Sankey. New York: International Music Co, 1963. Fesch, Willem de. Sonata: In G Major for Strings and Piano. Arranged by Stuart Sankey. New York: International Music, 1965 (1979). Franck, César. Sonata in a Major for String Bass and Piano. Solo bass part arranged by Stuart Sankey ; Piano part edited by Robert Casadesus. New York: International Music, 1991 (2002). Granados, Enrique, and Stuart Sankey. Madrigal in a Minor: For String Bass and Piano. Arranged by Stuart Sankey. New York, NY: Internat. Music Comp, 1982. Grieg, Edvard. Sonata in a Minor, Opus 36: For String Bass and Piano. Arranged by Stuart Sankey. New York: International Music, 1994. Handel, George F. Sonata No. 3 in G Major for String Bass and Piano. Solo bass part arranged by Stuart Sankey ; piano reduction arranged by by K.H. Fuessl. New York City: International Music Co, 1991. Handel, George F. Sonata No. 4 in D Major for String Bass and Piano. Solo bass part arranged by Stuart Sankey ; piano reduction arranged by by K.H. Fuessl. New York City: International Music Co, 1966. Marcello, Benedetto. Sonata: In C Major, for String Bass and Piano. Arranged by Stuart Sankey. New York: International Music Co, 1965 (1992). Marcello, Benedetto. Sonata in D Major for String Bass and Piano. Arranged by Stuart Sankey. New York: International Music Company, 1966. Mozart, Wolfgang A. Bassoon Concerto in B Flat Major K. 191: For String Bass and Piano. Piano reduction by H. Kling and K.H. Füssl. Arranged for bass by Stuart Sankey. New York, NY: Int. Music Comp, 1964 (1985). Paganini, Nicolò. Variations on One String on Rossini’s “Moses”: For String Bass and Piano. Arranged by Herman Reinshagen originally and Stuart Sankey for this edition. New York City: International Music Co, 1980. Double Bass Recital: Racz, Odon – Bottesini, G. Hong Kong: Naxos Digital Services US Inc, 2013. Rachmaninoff, Sergei. Vocalise Opus 34, No. 14: For String Bass and Piano. Arranged by Stuart Sankey. New York: International Music, 1968 (1985, 2014). Romberg, Bernhard. Sonata in E Minor: Opus 38, No. 1, for String Bass and Piano. Arranged by Stuart Sankey. New York: International Music Co, 1970 (1979). Saint-Säens, Camille. Allegro Appassionato, Opus 43: For String Bass and Piano. Arranged by Stuart Sankey. New York: International Music Company, 1971 (1980). Schubert, Franz. Sonata in a Minor (“arpeggione”) for String Bass and Piano. Arranged by Stuart Sankey. New York: International Music Co, 1963. Schumann, Robert. Five Pieces in Folk Style: Opus 102 Bis, for String Bass and Piano. Arranged by Stuart Sankey. New York: International Music Co, 1991. Stamitz, Karl. Concerto in D Major, Opus 1, for String Bass and Piano. Arranged by Stuart Sankey. New York: International Music Co, 1998. Telemann, Georg P. Sonata in D Major for String Bass and Piano [twv 41:d6]. Arranged by Stuart Sankey. New York: International Music Company, 1957 (1965, 1977). Telemann, Georg P. Sonata in E Minor for String Bass Solo. Arranged by Stuart Sankey. New York City: International Music Co, 1967. Telemann, Georg P. Sonata in E Minor for String Bass and Piano [twv 41:e5]. Arranged by Stuart Sankey. New York: International Music, 1976 (1983). Telemann, Georg P. Sonata in F Minor for String Bass and Piano [twv 41:f1]. Realization of the figured bass by Robert Veyron-Lacroix. Solo bass part arranged by Stuart Sankey. New York: International Music, 1968 (2000). Telemann, Georg P. Concerto in G Major for String Bass and Piano. Arranged by Stuart Sankey ; piano reduction by Giuseppe Piccioli. New York: International Music, 1948 (1969, 1985). Telemann, Georg P, and Stuart Sankey. Sonata in a Minor for String Bass and Piano. Arranged by Stuart Sankey. New York: International Music Co, 1957. Telemann, Georg P. Sonata in a Minor for String Bass and Piano [twv 41:a6]. Bass part arranged by Stuart Sankey. Piano realization by Diethard Hellmann. New York: International Music, 1965 (2000). Vivaldi, Antonio. Concerto in a Minor, Op. 3, No. 6 for String Bass and Piano. Arranged by Stuart Sankey. New York: International Music, 1963. Vivaldi, Antonio. Concerto in D Minor, F. I, N. 176 (opus 3 No. 6): For String Bass and Piano. Arranged by Stuart Sankey. 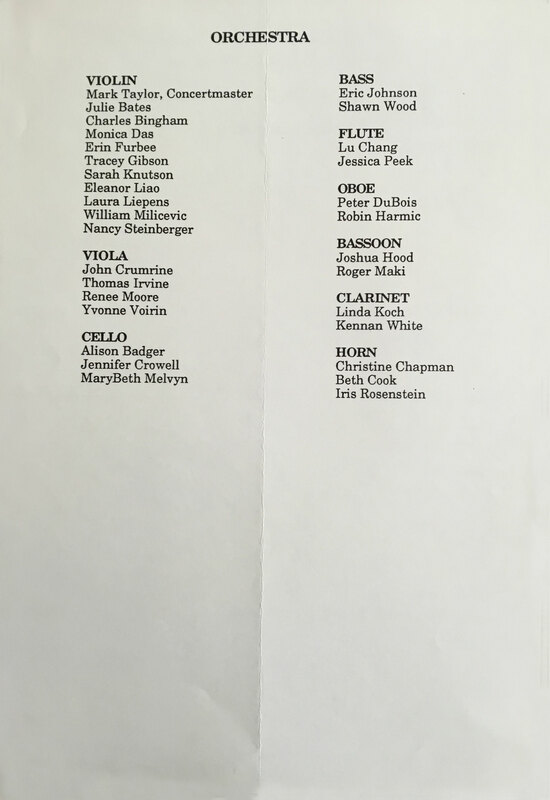 New York, NY: International Music Comp, 1992. Vivaldi, Antonio. Sonata in D Minor for Three Violins and Piano. Edited by Josef Gingold, Arranged for double bass by Stuart Sankey New York: International Music, 1964. Vivaldi, Antonio. Sonata in D Minor for String Bass and Piano [rv 14]. Arranged for double bass by Stuart Sankey. New York: International Music Co, 1987 (2000). Weber, Carl M. Adagio and Rondo: For String Bass and Piano. Transcribed for violoncello by Gregor Piatigorsky ; Arranged for string bass by Stuart Sankey. New York: International Music Company, 1982. 12 Duets for Two String Basses. Arranged by Stuart Sankey. New York: International Music, 1969. Telemann, Georg P. 6 Canonic Sonatas for Two String Basses. Arranged by Stuart Sankey. New York: International Music, 1969. 1. “Music at Michigan” The university of Michigan School of Music. vol. 20, no. 1, Fall 1986, p. 19.